If you search for “Ableton Tutorial” on YouTube you’ll be confronted with thousands of videos which range pretty widely in terms of their scope, production quality, and usefulness. Wading through all this material you’ll quickly find that many of the better videos tutorials come from people whose knowledge of Live is coupled with a talent for sharing that knowledge in an engaging manner. (Perhaps unsurprisingly, many often these people happen to be Ableton Certified Trainers). Sooner or later in your search, you’re sure to come across Afro DJ Mac. One of our favorite producers of video tutorials, he has produced dozens of clips that shed light on useful and sometimes quite unusual Live techniques. We like how each of his videos takes on just one technique and quickly makes clear how it can be applied to any number of music-making scenarios. Check out these three recent tutorial videos and then read our mini-interview with the man in shades himself. What got you started making video tutorials? I'm a high school English teacher by day, and teach the Advanced Music Production with Ableton Live course for Berklee Online. So teaching is a big part of what I do everyday. As YouTube started to grow, I began watching tutorials on music production. I was finding new music through the tutorials I was watching. I realized that creating tutorials is a great way to get my music to other people who were also interested in making music. Creating tutorials was a way for me to share my music and my excitement about making music with a large group of like-minded people. I know a lot of people that closely guard their secrets and techniques, but I really appreciated the people out there that freely shared what they were doing. People like Brian Trifon, David Earl, and Tom Cosm all had this attitude of sharing their ideas for the greater good of music in general. Plus I think if you give away your secrets, it forces you to come up with new techniques. You never get to rely on a certain bag of tricks, and I think that keeps you fresh as an artist. So in a way, creating tutorials is a great way to challenge yourself creatively. Do the techniques that you share in your tutorials come out of your own musical practice, or do you conceive of them separately and then incorporate them into your music. It's definitely a little of both, but most often it comes from something I'm doing. My biggest focus has always been creating instruments and sound design. It's really what got me into more electronic-based music. I love how new sounds can be made from almost any source material, and with a little work, you can have instruments that no one else in the world has. So, very often my tutorials stem from some new instrument I've created for my own music. Every once in a while though, I come across a new technique or find interesting solutions to problems I have or my students have. I try to focus my tutorials on practical ideas that will help people create music, rather than explaining what each feature or button on the screen does. What kind of feedback do you get from viewers? The feedback is generally positive. Nothing is cooler than a person sharing a track they made with a sound or idea I shared with them. It never ceases to amaze me how many people you can reach online. The world has truly gotten smaller and you can find interesting and inspiring people in all corners of it. Inspiration creates a bit of a feedback loop. The more you are around it the more you feel it. It's really the fuel that keeps me going. But as we all know, sometimes the anonymity of the internet brings out the dark side of people. For instance, I've been chewed out a few times because my free Ableton Live Packs are not truly free because they require an email address. Sometimes even my mother or dog will be dragged into the comments. You can't take it personally. I either ignore it or kill it with kindness. There have been lots of people who change dramatically when you are nice to them. It's kind of hard to continue to be nasty to someone who is super friendly. 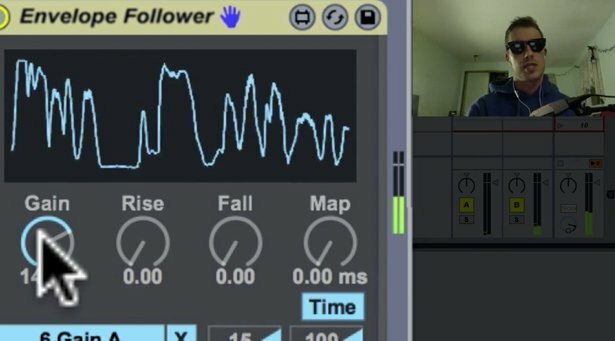 You're an Ableton Certified Trainer, do you also have a musical upbringing? I began playing music, with the guitar, at 14. It was one of those eureka moments. A friend of mine showed me how to play "Enter Sandman" by Metallica, and it just blew my mind. Up until that point in my life, it never occurred to me that if I had a guitar (or any instrument for that matter) that I could play the songs I heard on the radio. I think that growing up watching music videos on MTV made rock stars seem so much larger than life. Guitarists, singers, and drummers seemed to have super-human powers. It wasn't until my friend started playing guitar that I realized that even regular, mortal human beings could play rock and roll. I had a great guitar teacher, who was also a record producer, in the more traditional rock-producer sense. He taught me a lot about composition and theory. Aside from a handful of college electives, that's where my formal musical education ends. I did most of my learning "on the job." Years of playing in bands and learning new music was how I learned. Recording on 4 track tape recorders evolved into a pair of ADAT machines and ultimately ProTools. Once I wrapped my head around Live, I began to see the studio as less of a tool to capture pre-written music, and more of an instrument for creating new music. Go to Afro DJ Mac’s website to check out all of his tutorial videos, Packs and devices. Learn more about Ableton Certified Trainers.